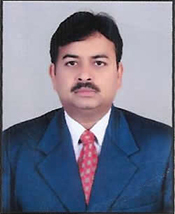 Dr. Radheshyam Prasad has graduated in law with first class in 1997 and post graduated in law of crime and torts in 1999 from JNV University, Jodhpur. He has also post graduated in political science, in first class from CSJM Kanpur University and awarded Ph.D. in law from University of Petroleum & Energy Studies (UPES), Dehradun. Further, he has twice qualified UGC (NET) in law in 1999 and 2000 respectively. He has very good academic experiences and taught in various universities like associated law colleges of University of Pune, CSJM Kanpur University and University of Petroleum & Energy Studies, Dehradun. He has joined this National Law University in the year 2013. He teaches under-graduate as well as post-graduate courses and also guides students in writing their projects, sectoral reports and dissertations of law. He also actively participates in the corporate life of the university. He has organized several conferences, seminars, moot court competitions, trail advocacy, law fest etc. He has participated and presented research papers covering diverse areas of law in more than 25 various international and national conferences and seminars and has more than 10 research articles to his credit, published in various ISSN refereed journals. Criminal law, Law of Torts, Property laws, Contract laws and Procedural laws are his area of teaching and research interest. He is a life member of All India Society of Criminology and The Indian Society of Victimology. .